Merely fidgeting and shivering can burn calories, but now you can add trembling in fear to the list too. Just pop in a good horror movie and turn down the lights to burn off up to 200 calories. What would you rather do? Walk for over 30 minutes or watch a 90-minute scarefest? In a study commissioned by Amazon's LOVEFiLM service, Dr. Richard Mackenzie, specialist in cell metabolism and physiology at the University of Westminster, measured the heart rate, oxygen intake, and carbon dioxide output of participants who viewed ten different popular horror movies. Out of all the movies, Kubrick's horror classic The Shining gave the best results, with 184 calories burned, followed by Spielberg's Jaws at 161. 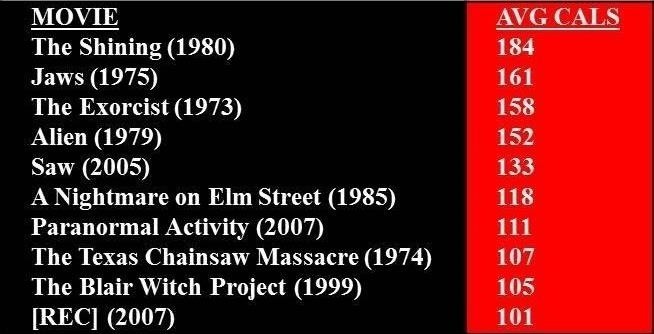 You can see some of the other movies and results listed below. As you jump at creaky doors and dramatic music during a scary film, your brain produces more adrenaline and ramps up your heart rate, which in turn ups the speed at which you breathe in oxygen and exhale carbon dioxide. Your racing pulse puts your body in stress mode, getting your blood pumping and calories burning. Although jumping jacks are great at getting your heartbeat racing, you would have to perform 30 minutes worth of them to get the same burn as watching the The Shining, and it'd take a whole hour of cycling to match the 158 calories burned watching Linda Blair's head spin in The Exorcist. And while more recent films, such as Saw and Paranormal Activity burn slightly fewer calories, they'll give you about the same results as performing more than an hour's worth of yoga would. Or course, the amount of calories burned will vary depending on your personal scare factor. They have to be genuinely scary to you, so if the sight of blood terrifies you, choose a gory slasher flick. If you're frightened of ghosts, go with a movie about haunted houses. Whatever sets your heart racing, make it part of your movie night. If you aren't terrified, you're not going to burn hundreds of calories. Turn off your lights. It doesn't get any simpler than that. It'll keep your focus on the TV screen, allowing you to get lost in the movie without real-life distractions. After all, some of the scariest movies (for me, anyway) take place in empty, poorly-lit places; those bumps and creaks around your house will only add to the scare factor. 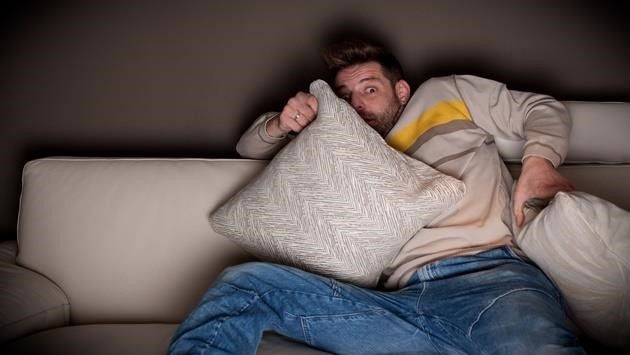 If you're the type of person who hides behind pillows or blankets during a terrifying scene, well, don't—keep them out of arm's reach for more calories burned. The shielding action reduces your fear level and causes your adrenaline to drop. Yes, there are some post-movie benefits, too. Just like a sweaty workout session, horror movies keep your body running even after the credits roll. Your appetite will decrease and your metabolism will increase—and it's all thanks to adrenaline. It takes some time for your body to calm down, so your heart rate will remain elevated until you've used up all that extra adrenaline. So, if you're someone who saves scary movies for Halloween, you might want to consider breaking them out more often. They could become an integral part of your "workout" routine, helping you burn calories beyond the gym. Just make sure you skip the popcorn and soda.